I hate it when stuff like this happens. This week I discovered an AWESOME integration point between Lotus Connections and Sametime Advanced. 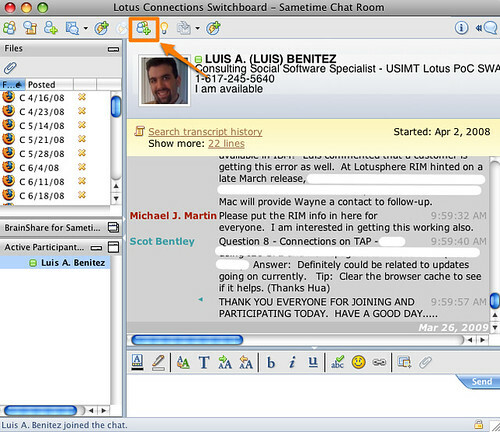 You may already be familiar with how Lotus Connections and Sametime Advanced integrate through the Broadcast Chat feature (if not, check out the video below at 3:40). Basically, each community you belong to in Lotus Connections becomes a channel in your instant messaging client. That means that you can collaborate in real-time with the community! You can send real-time surveys, announcements, chat requests, and questions to your Lotus Connections Community directly from your instant messaging client. You can download the plugin that Suzanne shows in the video above from here. Nifty, eh? Well, it gets better. Sametime Advanced also provides persistent chat rooms. 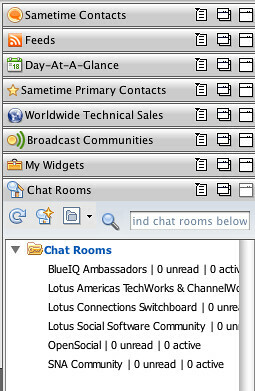 Up to now, I've been using these chat rooms through a web browser interface that Sametime Advanced provides. What I discovered this week is that you can access these chat rooms directly from your Notes or Sametime client! So why is this useful, you are asking ? Well, for one you don't have to run a browser to use the chat room. The chat room just works from where you would expect it to: your instant messaging client. As a community leader, it provides another huge advantage. You see, I use the persistent chat room provided by Sametime Advanced as a backchannel during the weekly calls of the Lotus Social Software community. 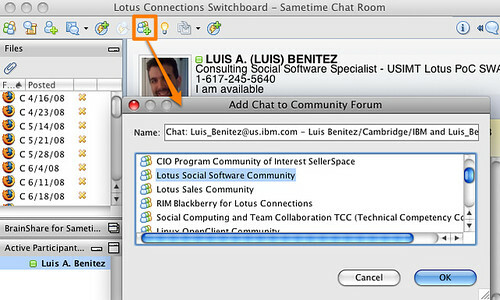 Since I have the Lotus Connections Sametime plugin, once the call is done, I can save the chat transcript directly to a forum posting in my Lotus Connections Community! Now THAT'S increasing my productivity. Install the Sametime Advanced plugin on your Sametime client (ask your system adminitrator for details). IBMers, you can get it here.